My active interest in all things Star Trek ended somewhere in the middle seasons of The Next Generation. I skipped everything after that, and frankly, didn’t feel too bad about it. Now that the entire Trek library is on Netflix streaming, I’ve slowly been making my way through the back catalog, and just so happen to be on the last season of Voyager as I write this. I remember playing Elite Force when it was released and having a pretty favorable opinion of it, and now I can also speak to it as someone who gets most of the fan service references. The Hazard Team is always getting into scrapes. Star Trek: Voyager follows a lone Federation ship trying to make a 70,000 light year journey back to Earth, through unexplored (and frequently hostile) space. Admittedly, this makes a pretty serviceable setup for the Star Trek first person shooter you get with Elite Force. Cut off from all supplies or backup, it makes sense that Voyager would explore the idea of the Hazard Team – a highly-trained tactical group with the best equipment and best weapons for the most dangerous missions. In today’s pulse-pounding episode (somewhere around the sixth season), the Hazard Team sees its first action when a mysterious probe teleports Voyager into a “starship graveyard;” leaving the ship trapped and waiting for dis-assembly by a hostile alien force. You play as Ensign Alex Munro, leader of one of the team’s squads. Alex can either be male or female (if you want consistency with Elite Force II, pick male), and the choice affects only the lead voice actor and some suggested romantic entanglements. You’ll be working with a brand new group of teammates created for the game – while the show’s cast can’t be killed or harmed, these new guys sure can! Between missions, you’ll interact with every cast member from the show (voiced by their actual actors), taking briefings, fixing plasma leaks, and getting an endless supply of disapproving frowns from your boss, Commander Tuvok. The plot, and particularly, the storytelling, is actually the game’s best feature (that plot was even somewhat reused in the seventh season episode The Void). It’s got a satisfyingly quick pace to it, and is reasonably set up like an episode of the show. 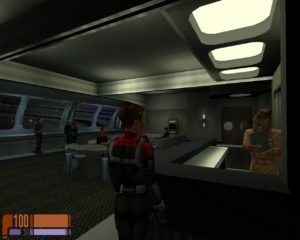 Pre-rendered cutscenes play between missions – even if it’s just a simple establishing shot of Voyager – and you’re always given some down time to chat with team members or visit other parts of the ship. It’s clearly influenced by Half-Life, but takes scripting and in-character storytelling a logical step further to create the sense of a series of interconnected assignments with consequences that remain after you transport back. Power shots disintegrate enemies, Wrath of Khan style. 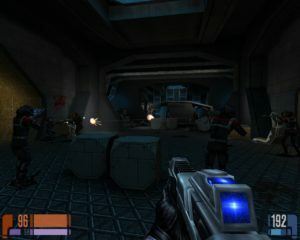 However, the gameplay itself is completely standard FPS action. It’s done competently, but if you’re expecting more than typical shooter action with a coat of Trek paint, it’s not here. Your Hazard suit mimics Gordon Freeman’s duds, and restores health through limited-supply power boxes mounted on walls. A miniature transporter on your belt lets you hold an entire arsenal (nine weapons in all) in a “pattern buffer” for easy retrieval. Enemy AI either skips from cover to cover (for ranged enemies) or charges blindly at you (for melee), making them all not much more than basic pop-up targets. Weapons even break out into sci-fi versions of FPS stalwarts, and it’s not too hard to spot the chaingun, shotgun, rocket launcher, sniper rifle, and so on. Each weapon has a secondary fire that usually results in a charged shot, rather than anything different. Only the scavenger rifle’s grenade shot is particularly useful. The Trek phaser weapons follow the show instead of FPS standards, and so benefit from having the most unique combinations (low/high power settings). However, the disintegration shots eat up ammo too quickly to use often. There’s also no location-based damage – not even extra damage for headshots – so battles are simple “plug away til they fall” affairs. And while the Hazard Team makes some sense in the context of Voyager, their propensity for wasting no time in killing everyone (again, typical FPS) seems a bit out of character for Starfleet. A bigger issue, though, is the game’s tendency to reduce the series’ most deadly villains into mindless target practice. 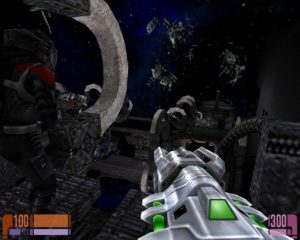 Borg cubes are nothing to the Hazard Team – while Borg will become invulnerable to each weapon type after a few shots (a nice touch), the super-convenient “Infinity Modulator” weapon circumvents this entirely. The nigh-invulnerable Species 8472 makes a cameo, and they fall to your weapons just as quickly as the formerly-formidable Borg. Even the mysterious “Harvesters” that have trapped Voyager spend time getting set up as the most deadly race yet seen – one that’s torn apart every ship and species thus far trapped in the junkyard – and end up being nothing more than some skittering bugs that topple over after a few zaps from the Tetryon chaingun. Between missions you’ll hit up ship landmarks and gab with the crew. Again, I’m not trashing the game. It’s all competent gameplay, but while there are some light puzzles and unenforced stealth sections, the action is ultimately strictly routine. It’s up the plot and scripting to carry the day, which luckily, it absolutely does. Every mission teams you with up to three members of the Hazard Team, with yet more communicating over radio from elsewhere in the level. There’s friendly chatter that characterizes them, mission updates that foreshadow trouble ahead, and even a scripted death or two. Mission specialists (such as demolitions or door hacking) will step up to their jobs without prompting, and help make the group feel like a functional team. The AI occasionally comes at a cost – such as having to wait for each guy to individually board an elevator – but their contributions to making the game feel like a TV episode far outweigh such issues. Graphics are provided by the Quake III engine, and it does decent work with lighting and complex architecture. The hallways and recognizable setpieces of Voyager are rendered surprisingly well, and while perhaps a little light on props, I never felt that these representations were cheap or hindered by technology. Characters do far worse, with blocky appendages and stiff animations. Character shadows (based on the model) are a nice idea, but they seem to be reacting to invisible light sources and jump around distractingly. Face skins at least cycle through some basic, still variants, giving some life to the performance – mouths will move, eyes will squint, etc. The junkyard setting is used as a reasonable license to explore a gambit of alien ships, and all are conceived and designed well. Borg cubes look the part, new alien vessels are appropriately weird, and the rag-tag scavenger base is a brilliant mishmash of Klingon and Original Series ship parts. Zero-G sections offer some platform jumping challenges. Nothing too severe. The best way I can describe the sound is “authentic.” Everything seen on the show, from Phaser blasts to the sound of doors opening, is identical here. New effects slot in seamlessly. Voice work is excellent all around. The show’s actors voice their characters comfortably, and professionally (no “phoning it in” here). Your teammates do a fine job, and either Alex or Alexia play the part of Munro convincingly. The only disappointment – and even that description isn’t fair – is with teammate Biessman. He’s played by Tom Wilson in full-on “Biff from Back to the Future” mode, and his hotheaded tendencies and constant frat-boy antics make you wonder how he made the team. But that’s really a problem I have with the character, not Wilson’s performance (I’m mostly sorry he’s so typecast). By law, Elite Force contains a forgettable multiplayer mode. 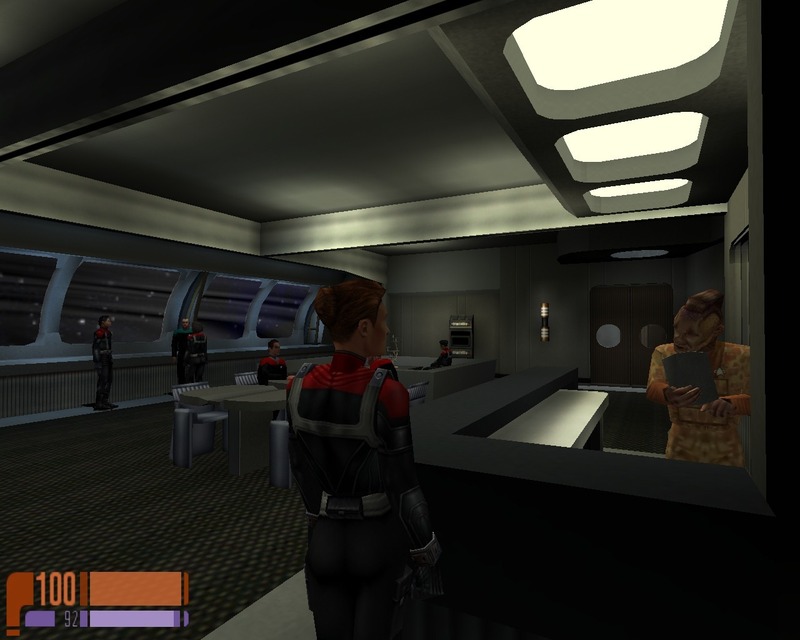 It takes place in various virtual environments spawned by the Holodeck, allowing you to visit such charming sights as the Klingon homeworld, a capture-the-flag platform in space, and Raven Software’s HQ made up as a Federation ship. This is absolutely and in every way Quake III with Voyager skins, and feels like a waste of everyone’s time. I’m sure someone was making a Star Trek mod for Quake III, and this is likely better than that was, but its existence still feels totally unnecessary. We can debate the merits of whether Star Trek needed a first person shooter or not (I’m in the camp of “ehh, whatever”), but regardless, Raven has delivered a fine one. It’s got a quick pace that keeps you interested, shouldn’t last more than a weekend, and can be quite challenging at the hardest difficulty level. It may not do enough (or even much) to differentiate itself in the gameplay department, but the environments, nods to the show, and excellent characterization are all top shelf, and a great example of FPS storytelling. Voyager interiors look great. Full cast of show vets and Hazard Team newcomers all play their roles well. Gameplay is solid enough. Great use of character scripting and down time to make the game feel like a TV episode. 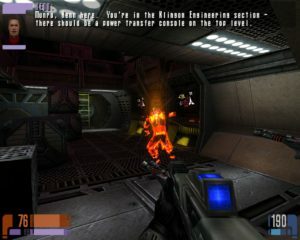 Just another standard FPS as far as gameplay is concerned – ruthlessly blast down all the Trek regulars in a linear series of corridors. Forgettable multiplayer.